Great post! I assume you drilled the enclosure before applying the decal? Thanks Henry! Yeah, I drilled the enclosure before applying the decal. The decal seems to be pretty sensitive and it got lifted slightly around the pots and switches, especially when tightening the switches. Maybe I should have used more lacquer. And remember to cut the holes for pots and switches on the decal before you apply the final lacquer.. I cutted the holes on the decal after the lacquer and it was a bad idea. After you print the decal, give it 2-3 coats of lacquer and let it fully dry, 12-24 hours. Slide it on the case, carefully and patiently smooth out the bubbles and any wrinkles. Also need to make sure there ore no surface bumps before you lay it down. Let dry overnight. Cut the holes using an xacto blade and then apply 2-3 more coats and let it fully dry for 24 hours after the last coat. I built this one as well and agree, it sounds great. Thanks for the tips Pete! I'm still pretty stoked on this pedal.. it works so well for low-gain blues leads. There's a bit too much bass for my needs and overall the effect is pretty dark sounding. Maybe I should do some input/output cap mods for this one..
Great looking build! I've built a couple SHO's and a 2 in 1, those boost circuits add a particular brilliance to the sound.now I think I need one of these. Again, beautiful build, man. Can you get the golden version of these knobs as well? and if yes, where (did you get yours)? 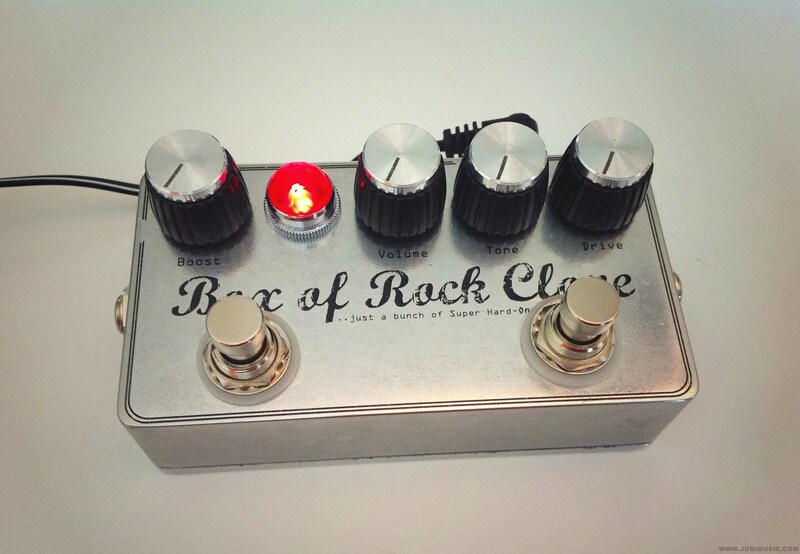 Hi,i'm a french beginner in DIY.I love this pedal.Is there a PCB of this diy pedal? Hi Carlo. 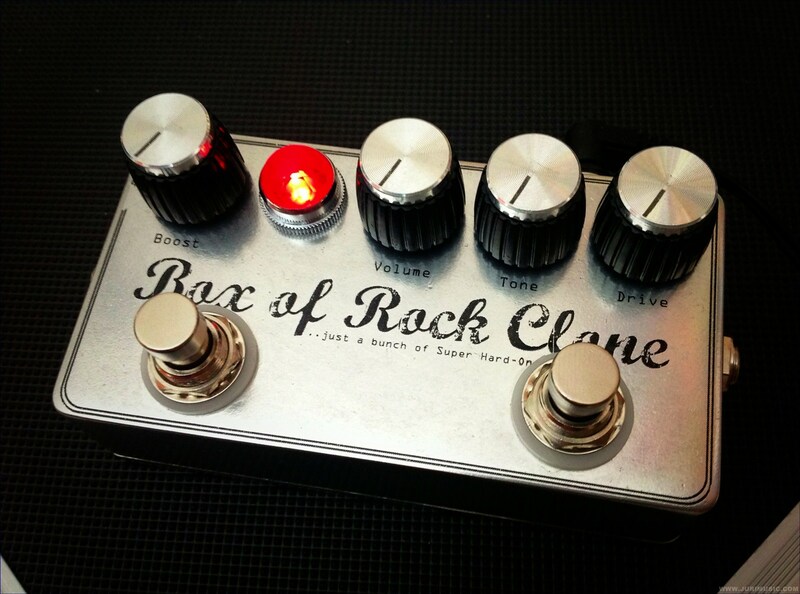 Yeah, actually there is.. Poodle's Pedal Parts (http://shop.pedalparts.co.uk) sells circuit boards and kits for BOR (it's called Rock Box). I have ordered few Klon PCBs and some parts from Poodle and they have been top quality. Hi can i buy one? Do you build and ship? Hi Søren! Yeah, I could make one for you if you're interested.. Send me a message to contact(at)jurimusic.com and we can talk more! First off - the design of your site is killer... very nice, clean look, and a tasty graphic at the top. Seeing that the header mentions live-looping - I know I'll be back. The pedal itself - well, I've been using IvIark's layouts for awhile myself - nice clean build there. The graphics on the pedal, just as you said - evoke Marshall... with the chrome-ish faceplate and graphics -- NICELY DONE! I would have been interested in seeing a gutshot with the offboard and all the rest, but the images you do provide are great, so can't really complain. I've a question about using the Jewel - I have a few in my toolbox from past and future tube-amp builds, and I really like the classiness that it adds to this build. The question is - how are you powering the jewel? In my amp builds, iirc, I've powered those with the incoming AC line, pre-standby; did you get a low-voltage bulb (I haven't gone searching yet ;-), or jury-rig clear LED in there, or ? (last question: Do you just have your domain redirect to blogger? I guess that must be it... otherwise there'd be like a "blogspot.com" on the tail end of the URL.. still -- fantastic usage of the tools my friend). Hi Stephen. Thanks for your kind words. I really appreciate it! On this project I had to leave the gutshot picture out because it was a huge mess.. :) If I would build this pedal again, I would definitelly use a pcb with board mounted pots. Apparently four pots and a LED is too much wiring for me..